WASHINGTON — Last week’s determination by the U.S. Commerce Department to impose prohibitive tariffs on aircraft from Canadian aerospace firm Bombardier could be the spark that ignites a long and bloodthirsty trade war involving the United States, Canada and United Kingdom. And although the Boeing-Bombardier dispute revolves around commercial planes, the impact on the U.S. defense industry has the potential to be huge, analysts tell Defense News. Tensions remain high between the United States and Canada after the U.S. Commerce Department proposed a 219 percent tariff on Bombardier’s C series aircraft on Sept. 26. And a separate, additional tariff of about 80 percent, announced Oct. 6, is sure to ratchet up the disagreement even more. Bombardier closed a $5.6 billion deal with Delta Air Lines for 75 C Series planes in 2016. Boeing retaliated this April, filing a complaint with the department alleging that Bombardier was able to dump low-cost aircraft on the U.S. market due to receiving subsidies from the Canadian government. Canadian leaders returned fire by threatening to cancel an order for 18 Boeing F/A-18E/F Super Hornets. Since the Commerce Department decision was issued, Canadian Defense Minister Harjit Sajjan doubled down on his pledge to seek out other options in lieu of the Super Hornets, although Canada has not formally withdrawn from negotiations. The dispute has also driven a wedge between the U.S. and U.K. governments, as a Bombardier plant in Belfast, Northern Ireland, is responsible for more than 4,000 jobs. On Sept. 28, U.K. Defense Secretary Michael Fallon warned that the dispute “could jeopardize” future defense contracts with Boeing, which recently ordered P-8 maritime surveillance aircraft and AH-64 Apache helicopters from the company. But three experts told Defense News the damage might already be done. Is the Super Hornet deal dead? Pretty much, although a resurrection is possible, analysts said. The Canadian government has yet to reach a final decision on whether to buy F/A-18E/F Super Hornets, but on Sept. 12 the U.S. State Department gave the green light for an eventual purchase of 18 jets. Roman Schweizer of Cowen and Co., was more hopeful, saying there could be a path for the deal to move forward. But effectively, all Boeing sales to the United Kingdom and Canada are on hold until the governments broker some kind of resolution. “I think it’s going to be a couple of months of pretty high stakes talks, and probably both sides digging in and posturing pretty hard,” he said. But Schweizer is hopeful the parties will reach a point “where Canada will then be able to make a decision whether Boeing is on the table, whether F-35 is back as a potential competitor or whether it looks elsewhere for a stopgap or longer term solution,” he said. If Boeing loses the Super Hornet deal, the popular consensus is that it will have little impact to the company’s overall revenue, as its commercial business is much more valuable than its defense side. But Aboulafia said that viewpoint is shortsighted. To maintain a steady production rate at its line in St. Louis, Boeing officials have said they need to make at least two Super Hornets or its electronic attack version, the E/A-18 Growler, per month. Except for a 23-unit spike in procurement planned for fiscal year 2019, the Navy plans to procure only about 14 Super Hornets per year over the next five years — about half of the number needed to sustain the line. The State Department has approved two potential high-profile fighter jet sales of up to 40 F/A-18E/F Super Hornets to Kuwait and 72 F-15QA planes to Qatar. Last year, the United States also cleared the sale of 40 Super Hornets to Kuwait, which could also fill the gap, but no final agreement for those planes has been settled. U.S. President Donald Trump and Canadian Prime Minister Justin Trudeau will meet at the White House the week of Oct. 9 to talk trade, specifically the North American Free Trade Agreement, but the Boeing-Bombardier spat could also potentially come up for conversation. Although the leaders of Canada and the United Kingdom have publicly, unequivocally criticized Boeing’s actions, Trump hasn’t involved himself in the dispute so far, but that could change as the situation grows more contentious. The Pentagon’s F-35 program director confirmed on Thursday that he was aware that the Boeing CEO was on the line during a Jan. 17 call from then President-elect Donald Trump. Trump has forged a close relationship with Boeing CEO Dennis Muilenburg over the past 11 months since he won the presidency — to the point where, earlier this year, Muilenburg was allowed to listen in on a phone call Trump was making to the head of the F-35 program when the Boeing executive arrived early for a meeting. That rapport, and his espousal of “America First” trade policies, could make Trump a fierce proponent of Boeing. Trump’s “Buy American” rhetoric set the stage for Boeing and other companies to rally for more protectionist trade policies, but he could see an opportunity to step in now and broker a deal, Aboulafia said. Aboulafia added that the president has followed this pattern before, most evidently in the F-35 program: Trump pointed out its cost, got involved with negotiations and then finally took credit for savings that were likely already in the pipeline because of an increased production rate. What are Canada’s other options? If Canada walks away from Super Hornet buy, it could purchase used F/A-18 Hornets from another nation. Canadian leaders have already suggested that this option is on the table, with Australia and Kuwait both named by its defense minister Sajjan as potential sellers. “There will be a couple dozen F/A-18s coming available from a variety of people, and that represents a significant store of spare parts and perhaps even aircraft that are in better shape than the Canadian ones,” Aboulafia acknowledged. But such a solution is short term at best, and Canada will eventually need to start a fighter competition to replace its aging CF-18s. Canada will explore an interim buy of 18 Super Hornet fighter jets from Boeing, a blow to Lockheed Martin that kicks a final decision on whether to procure the F-35 further down the road. Boeing’s battle with Canada might be Lockheed Martin’s chance to revitalize its campaign in the country, and Trudeau’s chance to walk back his campaign promise not to buy the joint strike fighter. “Trudeau was kind of trapped by his own comments. He had said, ‘No, no no, Harper had it wrong with F-35, we’re going to look for alternatives, particularly the Super Hornet,’ but Boeing is giving him the option to say, ‘Harper was right,’” Aboulafia said. It’s a thin tightrope to walk: Lockheed needs Canada’s relationship with Boeing to sour in order to pave the way for an F-35 sale, but if its relationship to the United States goes too far south, Canada will also look past the F-35 and seek out European fighters, he said. However, Lockheed can exert its own pressure on Canada. As a partner on the F-35 program, an estimated 110 Canadian businesses have already been awarded contracts to help build the joint strike fighter, which the expectation that the country would eventually purchase the aircraft. Canadian firms have already made more than CA$825 million, or $668 million in U.S. dollars, from the program, but Lockheed has threatened to pull its business and find suppliers elsewhere if Canada turns its back on the program. 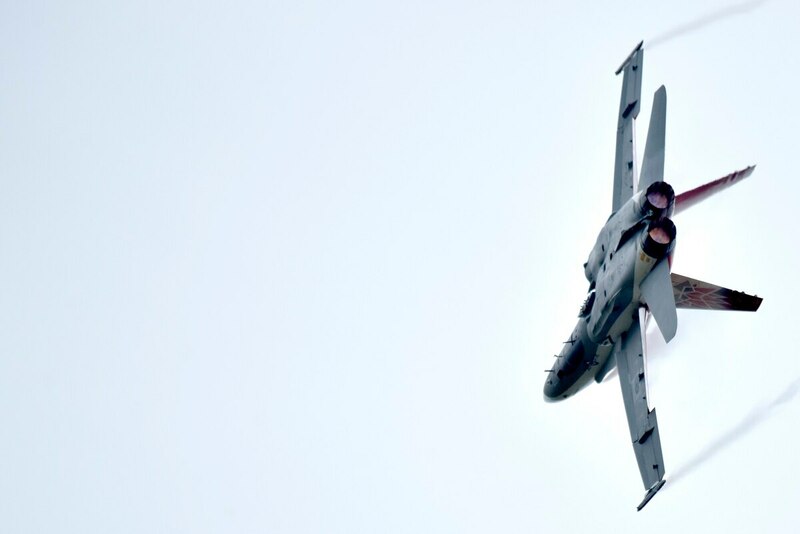 The minute Canada makes a firm decision to drop the Super Hornet buy, it loses its biggest bargaining chip in its legal battle with Boeing, said Schweizer, who argued that it’s really in Canada’s best interest to hold out as long as possible and urge Boeing to drop its complaint. The Canadian and British governments are combining forces against Boeing in a trade dispute that threatens the purchase of fighter jets as well as aerospace jobs in both countries. If relationship between Canada and the United States don’t improve, the dispute could push the Canadian government toward procuring a fighter jet from a European manufacturer, such as the Eurofighter Typhoon, Dassault Rafale or Saab Gripen E.
“A year ago I would have laughed if anyone said Canada might look at Eurofighter. Now I don’t know. Could be Gripens, or Rafale. It depends how bad relations get,” Aboulafia said. That would be the worst-case scenario, not just for the U.S. defense industry, but for the U.S. military, who would lose the interoperability it had shared with its Canadian allies for decades. “I think the thinking had been in Canada, before this, that when the U.S. goes to war, Canada goes with us because we’re allies. And if we’re going to go to war together, we’re going to need to have equipment so we can communicate and fight together,” Harrison said.